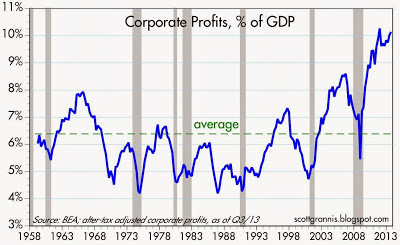 Corporate profits, corporate cash piles and corporate share prices are record high. 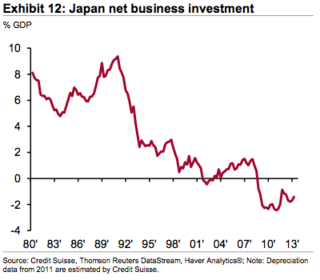 Yet corporate investment is at historic lows across US, Europe and Japan. Companies have cut costs to boost profitability, whilst (and because) revenues have remained persistently weak (which fits with demographic trends). 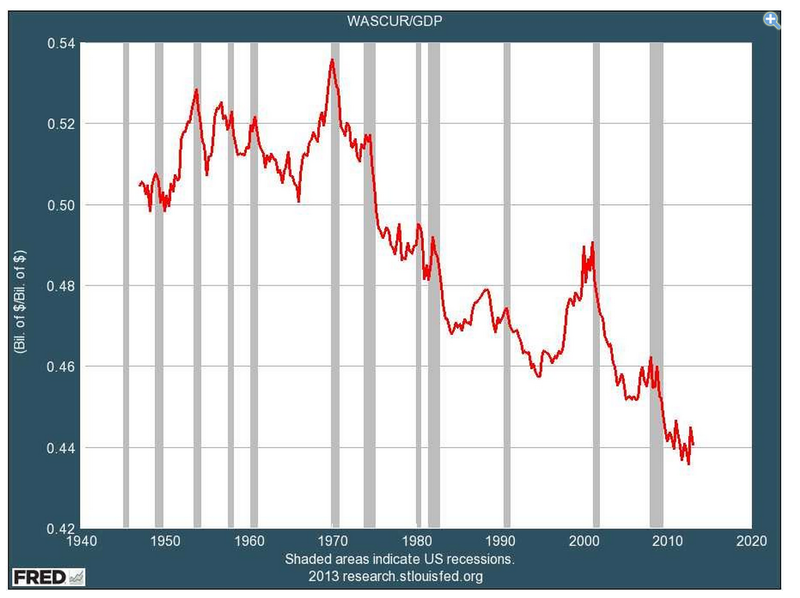 As a key part of the cost-cutting has been jobs and wages, this naturally creates a feedback loop back through weaker consumer spending to corporate revenues. Ultra low interest rates have also helped boost company profits. Recall from my post Tower Of Sand (HERE) that corporates have been borrowing a lot of cash and engaging heavily in share buybacks, buying shares from the open market and destroying them. The result is an increase in share price, and earnings-per-share (as there are less shares in circulation). No increase in revenue or profits but a payout to the stock investor. Shares rise, investors are rewarded and thus inclined to buy more, and that has played a key part in 2 years of over 80% multiple expansion versus less than 20% earnings growth. 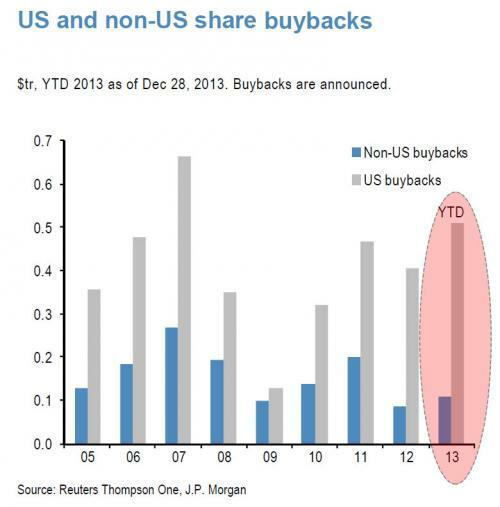 Buybacks escalated into the end of 2013, to a level last seen in 2007. Note that buybacks peaked just after the stock market in 2007. 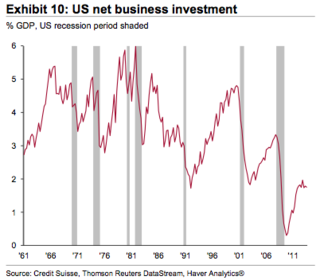 The ratio of corporate investment to investor-payout is now historically low. Companies in Europe, Japan and the US have remained fearful of investment in plant, equipment and technology due to economic uncertainty, particularly new tech and R&D which requires high funding without any certain return. 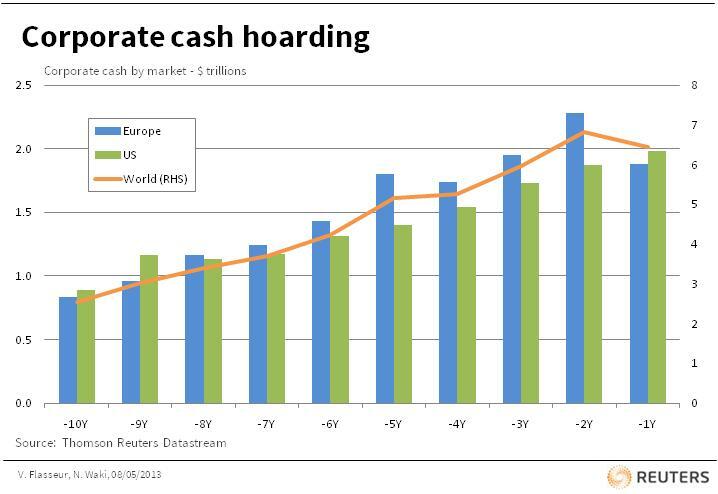 Hence they prefer to sit on cash piles, and keep investors happy with buybacks. In the short term, this shores up their position, but it is at the expense of their future, and, aggregated across all companies, the economy’s future. Without investment, future growth and future jobs are severely compromised. Investment was high and investor-payout low in the 1970s. 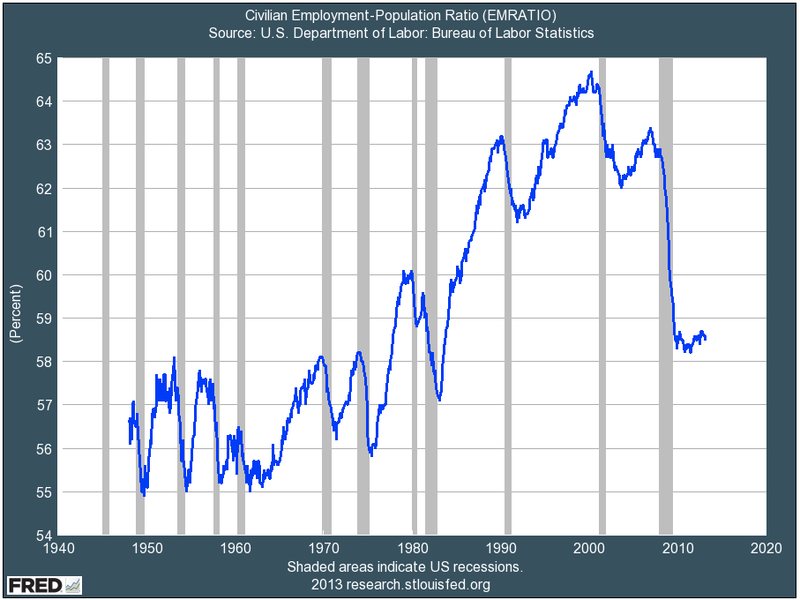 A boom followed 1980-2000. 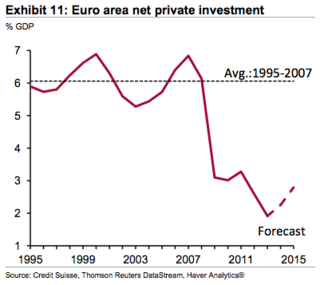 Investment has been low and payouts high in the 2000s, so the future is bleak. Better for shareholders if companies do not invest some university theories say as most companies squander their resources. Better are buybacks and dividends =). I do not think it matters for share prices as companies that have good ideas and need to invest do not need cash but can finance themselves through issuing equity or taking up debt hence capital markets. In the old days you could not transfer funds very fast etc and cash was much more needed. 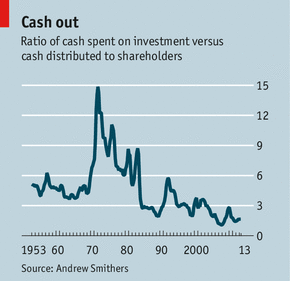 ‘cash out’ chart very interesting, the spike in the 70s preceded inflation and interest rates spikes in the 80s. Economically the future looks bleak to me with no looking at the numbers at all. Unless we have an industrial revolution like free energy (which is not so absurd; combining gravitation, magnetic fields and electricity, it should be quite easy to build something that consumes less energy that it creates, but I am not a physicist), unless we have a real economic reform : abolition of democracy (most idiotic system) abolition of this absurd level of taxation, abolition of state interference in everything (basically state treats people as imbeciles who should be guarded against themselves). There is a lot of possibilities which can occur. but if nothing happens, future looks bleak and people will become less and less able, as the governments discriminate against strong, healthy and independent individuals, while they rewards sick, unable, passive and criminal people, which means that those promoted will grow in number and those discriminated against will gradually disappear. Hi John, the big question – why is investment low? Can we agree that businesses exist to make a profit (i.e. a return on investment)? Then why do they decide to use excess capital to boost share price or return it to shareholders? The same thing is happening with governments. Which makes more sense, using borrowed money to provide a benefit or building infrastructure? What do you have in the end? A bridge, road, power plant or school that will serve a community of people for years and maybe attract new businesses to locate bringing jobs to the unemployed or ??? Why does it make more sense to spend than invest now? I’m not saying it’s an either/or choice but, it does seem lopsided. No? – Makes sense for a K-Fall versus a K-Spring / K-Summer.